I am writing up a campaign where the players start out as AeroTaxi drivers flying Ford Hoplites. But as you know there are no rules for Ford Hoplites, just the three autogyros that appear in "Wings Over Manhattan". So how would you write this up? 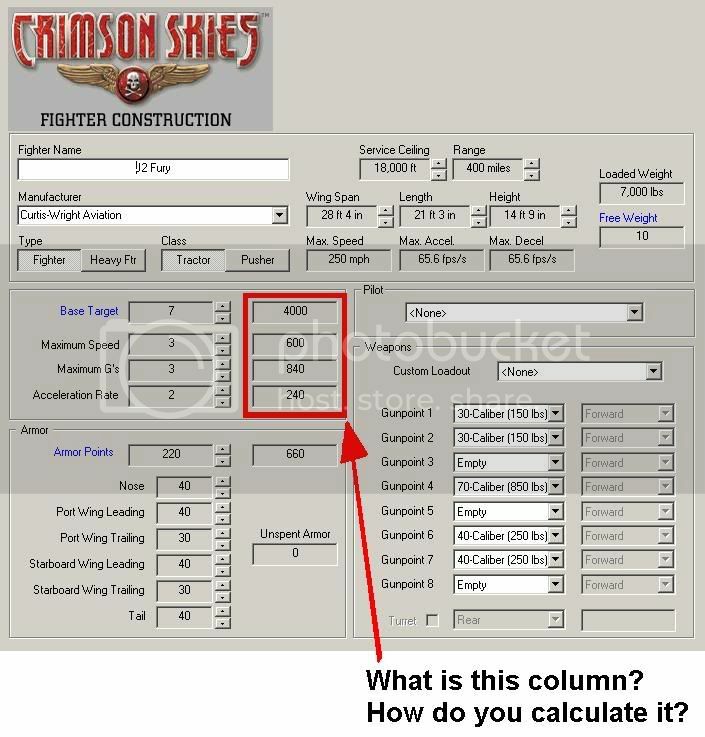 I started by getting all the costs and weights from the PC game's plane builder. Now thats as far as I want to go for now as these are unarmed AeroTaxi's, but how would you determine its Base-to-hit number, Max Accel, Max Decel & Max Speed? The rules say gyros' have to have a Base-to-hit of 6 min, and the rules also say gyros' have no wings. Are there any rules for generating new aircraft or is it all just best guess? Not sure about stats & such, but I loved the Hoplite in the first PC game! It was a lot of fun to fly! Autogyros when built MUST have a 5G wing rating. Other than that, stats are built the same as a aircraft, with speed,etc,etc. Just no armor added to wings. Do you have the Cadetwd? 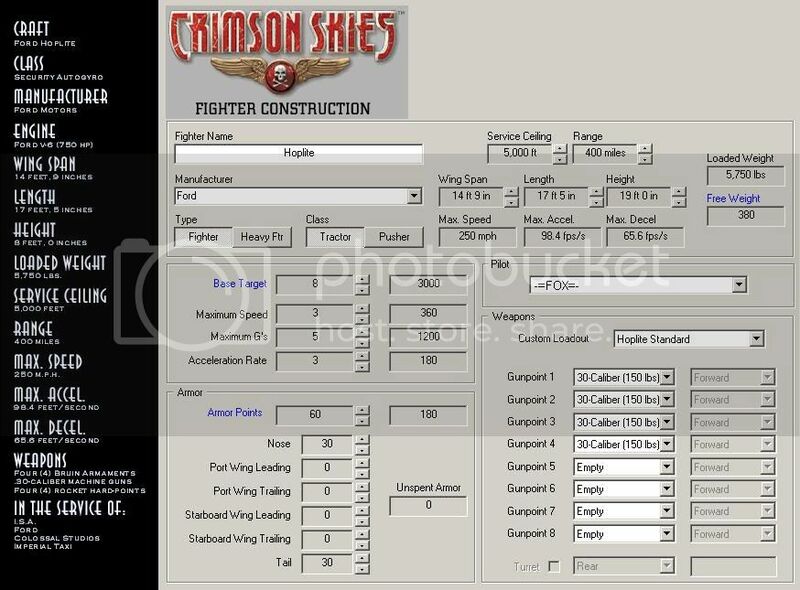 The "Official" Crimson Skies plane builder? (Computer program that you can use) Occasionally buggy, but pretty good for rough sculpting. Basically figure out roughly what speed, acceleration and armor it would carry and adjust from there to get the best "Feel" for the aircraft your building. For example (Not on the ford but my custom plane I am making). It is actually not that great of a plane, but it has "Character" for fluff. Aaahhh! Now I see . . . I was right, there is a calculation required for determining base-to-hit and Max Speed and Decel . . . .
and changing the values in Cadetwd till they matched, and it gave me the numbers I needed. I forgot to mention a big bug on CadetWD. If you are buildind an airplane and your experimenting with turrents,etc. REMEMBER+++++++++++++ If you have a turrent on the aircraft, and then uncheck the turrent box, the weight that turrent occupied (400LB+ 1/2 the gun weight installed in it) will disappear into never, never land. Yeah, I remember the Hoplite as being armed. Sort of threw me for a loop when you said that it was unarmed...let's see, I think that the Hoplite "mounts the legal maximum armament for civilian craft under Empire State laws". There we go. Legal Maximum armament is..(If I remember right without looking) is 4 hardpoints and 4 .30 machine guns.....Same as Pacifica. The hopite as an airframe has armament mounted, absolutley but for the start of my RPG campaign the players start out as your average run-of-the-mill slightly better than unemployed gutter trash that occupied the post-depression city streets. Besides Imperial Taxi Service owns the taxis, the pilots have to pay off the debt out of their earnings, as well as fuel and maintenence. Do you really think a union run taxi service will just hand out armed and loaded autogyro taxis? Thats what the players need to do while they run through the campaign. I see. Keep us updated. This should be interesting.